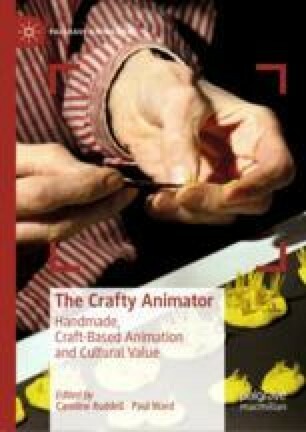 This chapter explores three examples of digital animation which conspicuously emulate handcrafted, cutout, home-made techniques, interrogating the various functions these imperfect aesthetics serve. Charlie and Lola’s montage style aligns the show with traditional culture aimed at and made by children, Comedy Central’s South Park evokes the amateur style of countercultural underground animation, while The Lego Movie’s stop-frame look connects with fan culture and adult toy animation. Variously producing a sense of naivety, unprofessionalism, playfulness and subversion, these aesthetic choices serve to negotiate tensions and contradictions circulating animation’s commercial, industrial and cultural status. In particular, the implication of a mythical child figure in these franchises’ production processes mediates their complex status as screen media, their relationship to modernity and technology and their appeal to audiences of adults and children.